This year we have seen several soybean stem and root rot diseases for which the main management action is the use of resistant or tolerant varieties. Everyone reading this article does not need to use a resistant soybean variety in all their fields, but many farmers would benefit from using them to manage specific disease problems. If you have a history of any of the problems mentioned below and a major area in a field is affected, make this a criteria in variety selection this year. There are enough resistant varieties on the market that you should be able to find varieties with the total genetic package you need. Unlike other traits that you pay more to have in your variety, disease resistance generally does not cost any more than comparable susceptible varieties. In recent years we have seen an increase in the number of fields with SCN. Producers are encouraged to use the free testing program administered by UNL and funded by the Nebraska Soybean Board to determine if a field has SCN. If you have a history of SCN and you have been using resistant varieties, make sure you are rotating the varieties in the field and if at all possible, rotate the source of resistance. There are three main genetic sources for resistance to SCN: PI88788, Peking (PI54840), and Hartwig (PI437654), marketed as CystX. Of these, PI88788 is found in the vast majority of SCN-resistant soybean varieties. As most readers will be using a PI88788 source of resistance, it is important to at least rotate the variety being grown in the field, as all PI88788 varieties are not the same. For more information see the UNL Extension NebGuide, Soybean Cyst Nematode: Identification and Management (G1383). Figure 2. Phytophthora root and stem rot. This disease has been very active the last two years. Early planting in wet conditions creates a situation very conducive for Phytophthora if it’s present. Dry conditions followed by heavy rains have also been observed to result in significant disease levels in fields with a history of Phytophthora. In most cases symptoms develop within a week of a heavy rain. In addition to using resistant varieties, make sure you use an increased rate of mefenoxam or metalaxyl seed treatment for these fields. Note that seed treatments will only be effective for about 30 days and this disease can infect and kill the soybean plant throughout the season – so resistance is key to management. Resistant Varieties: Using resistant varieties is the most effective means of managing Phytophthora rot of soybean. Genetic resistance is expressed in the host in terms of Rps (Resistant to Phytophthora sojae) genes. The genes are denoted as Rps 1a, 1b, 1c, 1d, 1k, 3, 6, and 7. The pathogen exists in races that interact with these genes. A race is identified by its interaction with the eight known Rps genes. The predominant races in Nebraska are 3 and 33. The most widely available resistance genes in the Midwest are 1c and 1k, commonly referred to as c or k in seed company literature. Gene 1c protects against races 1, 3, 8, 9, 13, 23, 28, 41, and 44 where gene 1k protects against races 1, 3, 4, 5, 8, 9, 13, 14, 18, 23, 43, and 44. Gene 3 is the only gene that protects against 99% of the races that occur in Nebraska. In addition to specific resistance, soybean varieties are also rated for “tolerance” to Phytophthora by many companies. Research has shown that a high tolerance score with a resistance gene is the best combination for managing this disease with genetics. Producers should keep records on which fields they identify with Phytophthora so that they can select soybean varieties with resistance and/or tolerance to the disease for those fields. This disease will not affect corn. Fields with a long-term history of Phytophthora may require a different resistance gene if you start seeing Phytophthora-killed plants even with resistant varieties. For more information see the UNL Extension NebGuide, Management of Phytophthora Root and Stem Rot of Soybeans (G1785). Figure 3. A white cottony fungal growth on stems is one indication of soybean infection by Sclerotinia Stem Rot. White mold or Sclerotinia stem rot is a disease that starts early in the season. The actual infection occurs on the senescing flower, which the fungus feeds on and infects. All infections in soybean will typically start at a node. You can even tell when the infection occurred based on how high up the plant the stem lesions and fungal growth are. This year’s cool, wet conditions during flowering were favorable for infection. Even at harvest you can identify Sclerotinia stem rot in the field as the stems will be very light (bleached) in color. Upon close inspection you will see dark black bodies (sclerotia) of the fungus on the stems. When dead stems are split, you often will see the sclerotia of the fungus inside. Management of Sclerotinia stem rot integrates variety selection and cultural management. Longer term rotations can help reduce sclerotia numbers. High plant populations and narrow rows can increase white mold potential. Varieties vary in their level of partial resistance, and no varieties currently have complete resistance. Select varieties with good scores for Sclerotinia in fields with a history of this disease over several years. This is not a disease we see every year in Nebraska, but some locations —typically in river bottom areas in the northern half of the state—have it more consistently. For more information on Sclerotinia, see the related resource on the North Central Soybean Research Program Plant Health Initiative website. Figure 4. To differentiate between brown stem rot and sudden death syndrome, split the stem. With brown stem rot, shown above, the center of the stem will be discolored and typically will be brown from the soil line upward. Figure 5. Foliar, stem and crown symptoms of sudden death syndrome are shown here. Foliar symptoms for sudden death syndrome and brown stem rot can be similar. Note differences in base of stems between Figures 4 and 5. 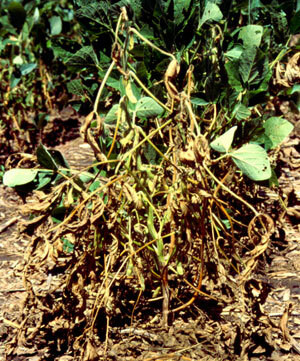 In 2013, many fields were affected by either brown stem rot (BSR) or sudden death syndrome (SDS). While foliar symptoms of these diseases are similar, there are key diagnostic differences in other symptoms. Management differs for the two diseases and requires a different variety selection process. Both can result in patches of soybean plants dying in fields. Foliar symptoms are not always present for BSR, therefore any pockets of stressed or dying plants can be suspect for the disease. Foliar symptoms start with interveinal necrosis; then the spots coalesce to form brown streaks between the leaf veins with yellow margins. Plants affected by brown stem rot will have some root rot, but it won’t be as extensive as plants with SDS where the root system will have a deteriorated tap-root and lateral roots will only be evident in the upper soil profile. Plants will typically pull easily and there may be a dark blue fungal growth on the roots with SDS. Plants affected by brown stem rot will not have root rot symptoms. Split the Stems. With any root and stem rot disease it is critical that you split the stems to accurately identify the disease. This is particularly true when trying to differentiate between SDS and brown stem rot. With SDS the center of the stem will not be discolored; discoloration will be confined to the outer stem layers. The root cortex also will be discolored — a light-gray to brown — and may extend up the stem. Brown stem rot will discolor the center of the stem and typically will be brown from the soil line going up. Examination of the split stem may show discoloration starting at the nodes. Variety selection will be your best option for managing both BSR and SDS. Fields with high levels of SDS should not be planted early in future years and should be managed to reduce compactions. Fields with brown stem rot will benefit from longer rotations, but fields with SDS will not be affected by rotation. For more information on brown stem rot and sudden death syndrome see the NCSRP Plant Health Initiative website.